AUGUST 1. DEANERY OF CENTRAL QUICHÉ. On August 1, with about 60 delegates from Cunén and Sacapulas as well as Father Luís Germán Guanopatín and subdeacon Marcos Caicedo present, our bishop, Mons. Eduardo, presided at the meeting of the Deanery of Central Quiché. Delegates from a community of Aguacatán, Huehuetenango, were also present. This community has joined the Communion of ICERGUA and this Deanery since it belongs ethnically and culturally to the Quiché group. The representatives of the communities described the successes and challenges that they have experienced over the past few months. 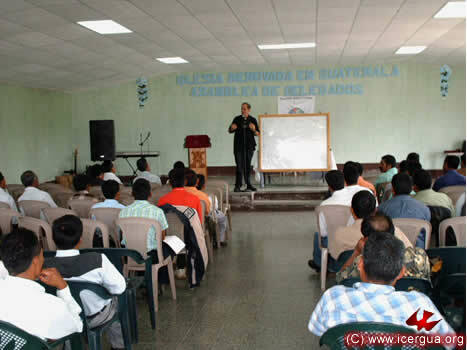 Then the bishop gave a full lecture on the identity and mission of ICERGUA. above: One of the delegates presenting the situation in his community. left: Some of the participants at the meeting of the Deanery. AUGUST 1. CONFIRMATIONS IN CUNÉN. 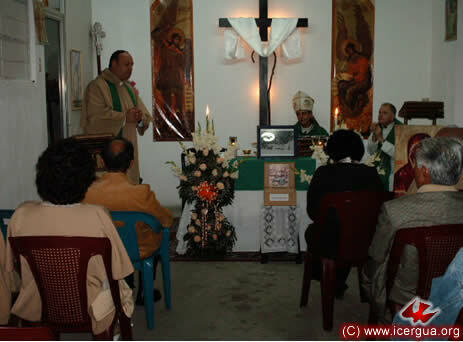 During the afternoon of August 1, Eucharist was celebrated in the house of prayer in Cunén, Quiché. During the celebration, 22 people received the sacrament of Confirmation. Most were adults, some quite elderly. In the past they did not have the opportunity to receive this sacrament. Now they have been able to complete their Christian initiation and are prepared to work actively in proclaiming the Gospel. AUGUST 1. CELEBRATION IN PUENTE CHUATUJ, SACAPULAS. Puente Chuatuj is one of the four Renewed Catholic communities in Sacapulas. Before the Eucharistic celebration, in which several baptisms were celebrated, there was a meeting with the directors of the communities to authorize them to use provisional sacrament registers until the number of members and the requisite organization are complete and they can be recognized as a Renewed Catholic Parish. above: Some of the faithful listening to everything said in the directors’ meeting. 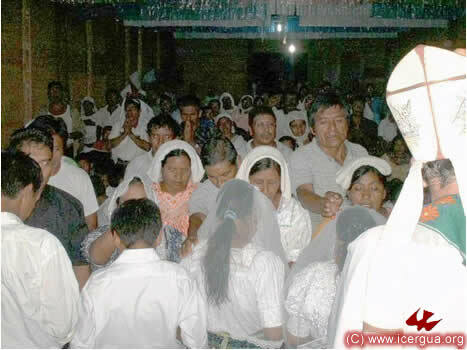 right: The parents and sponsors praying over the children who have beeen baptized. AUGUST 2. DEANERY AND THE CREATION OF THE USPANTÁN PARISH. On the morning of Sunday, August 2, with the assistance of about 50 servants of the Lord, our bishop presided at the meeting of the Deanery of Capítulo Uspantán. 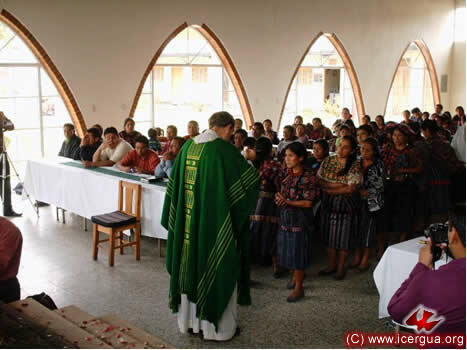 After expressing the joy and gratitude of all the communities for being constituted as a Renewed Catholic Parish, the bishop gave instruction for about two hours on specific details and the fundamentals of the Renewed Catholic ritual, stressing that it is a force for connecting the Latin liturgy with the Tradition of the indivisible church and emphasizing that the agent of liturgical sacramentality is the Holy Spirit and that the one who celebrates is the community, although it is necessary that it be presided by an ordained minister. At 2:00 on August 2 began the celebration of the Holy Mass in which would be proclaimed the creation of the Renewed Catholic Parish of the Most Holy Trinity of Uspantán and the altar whose construction is complete would be blessed. above: The multitude of the faithful who completely filled the church before the ceremony began. It is estimated that a minimum of 2500 faithful participated. The new parish has a membership of about 12,000, of which at least 3000 are active and committed adults. left: The presbytery of the parish church. 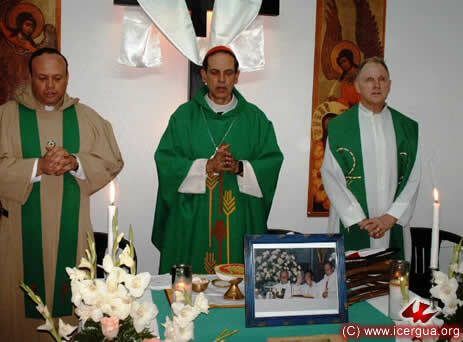 In the back at the right is Father Luís Germán Guanopatín, the parish priest and the person in charge of the Deanery, and at the viewer’s right of the bishop is the Reverend Marcos Caicedo. 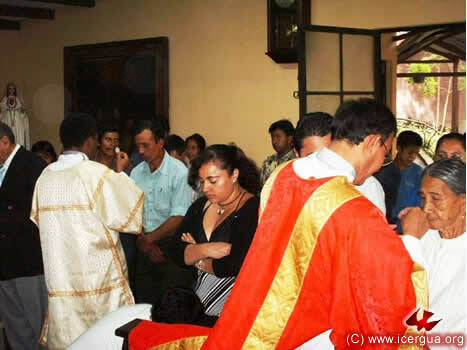 Before the proclamation that the Parish was constituted, Brother Baltazar Us, coordinator of the pastoral Council and the coordinators and secretaries of the other councils of the parish signed the threefold promise required for the establishment of a parish: (1) Permanent membership in ICERGUA; (2) Adoption of the Renewed Catholic Rite for celebrating all the liturgy; and (3) the commitment to organize the life and function of the communities in accord with the stipulations of the ICERGUA Constitution. 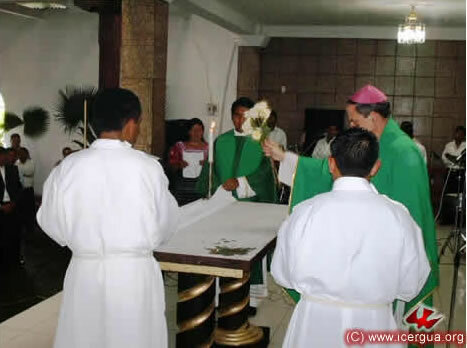 left: The bishop reading the decree establishing the Renewed Catholic Parish of the Most Holy Trinity, Uspantán. right: Blessing of the parish altar. left: Some of the 30 communities that form the new parish participated in the offering procession, carrying placards of welcome and thanksgiving. 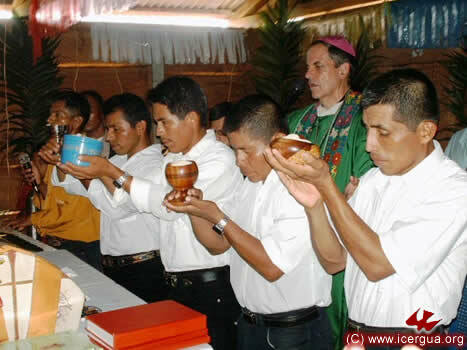 right: Because the Renewed Catholic Rite is the ritual of a Priestly People, the ministers of the communion, elected by the community, are the ones who present the offerings of bread and wine in the offertory and then, at the conclusion of the Eucharistic prayer, elevate the ciboria and the chalice. In the photo five ministers are elevating the ciboria and the chalice, while the Great Amen is being sung, ending the Eucharistic prayer. left: At the end of the Eucharist the bishop is expressing thanks for the readiness of the faithful to become a parish, as well as for the warm reception that was given him during his visit. AUGUST 6. 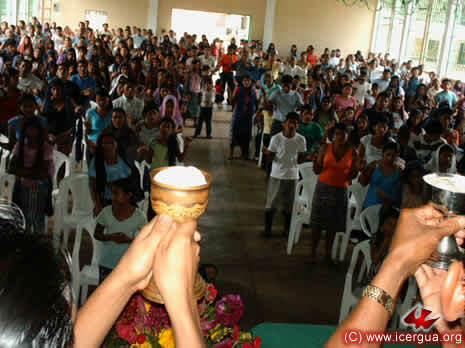 EUCHARIST IN CHICHICASTENANGO. 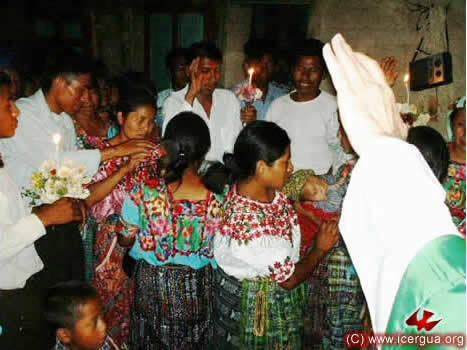 On the morning of August 6, at the invitation of the Chichicastenango Association for Community Development, the bishop presided at a Thanksgiving Eucharist for the agreement made this day between the Association and the Indigenous Mayoralty of Sololá. 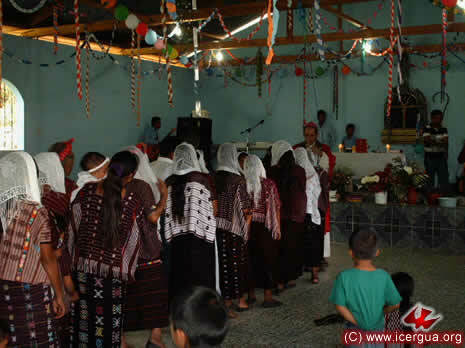 The liturgy was distinguished by the fact that the readings and the homily were done in both Spanish and the Maya languages of Kaqchikel and K’iche’. above: The participants giving close attention during the homily. right: The communion being distributed. AUGUST 6. 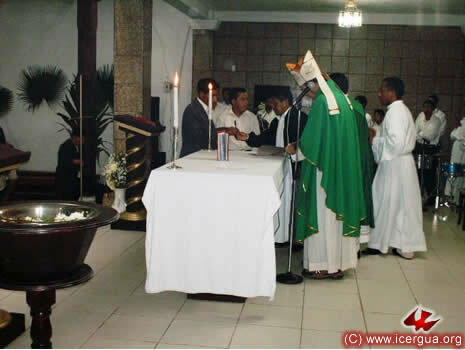 DEACONAL ORDINATION OF MARCOS CAICEDO AND GILDARDO RAMÍREZ. On Thursday, August 6, Solemnity of the Transfiguration of the Lord, during the afternoon, the solemn deaconal ordination of our brothers took place: Marcos Caicedo Tenorio and Gilardo Ramírez Godoy. They are doing their supervised pastoral field work in Uspantán and inTzanixnam, Totonicapán, respectively. Nevertheless, they asked that the ordination be done in the intimacy of the Seminary. The priests responsible for their field work were present as well as large delegations from the places of their pastoral work. above: Prostration during the singing of the Litany of the Saints. 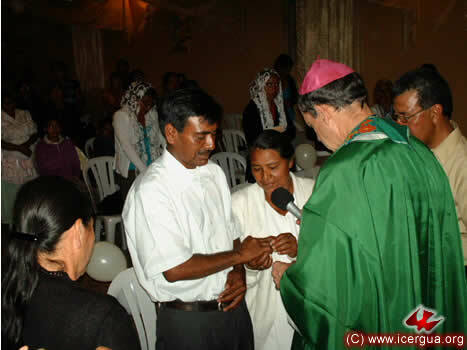 right: The laying on of hands, within the Consecratory Prayer, on Marcos Caicedo. The laying on of hands on Gildardo Ramírez. The families and sponsors are preparing to pray over the new deacons. right: As the new deacons distribute communion to the People of God, Deacon Gilardo gives communion to his mother, who is 96 years old. AUGUST 7. VISIT TO THE COMMUNITIES OF PAJOMEL AND CHUITZANCHAJ. During the afternoon of August 7, Mons. Eduardo visited the Communities of Pajomel and Chuitzanchaj. In the first, a marriage was celebrated; in the second, two First Communions. 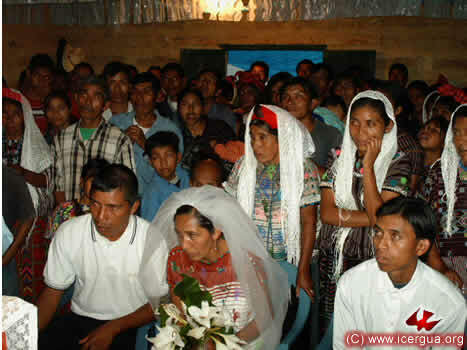 above: Marriage ceremony in Pajomel. right: A view of the church, recently built by the members. The photo was taken from the road that goes to the church. 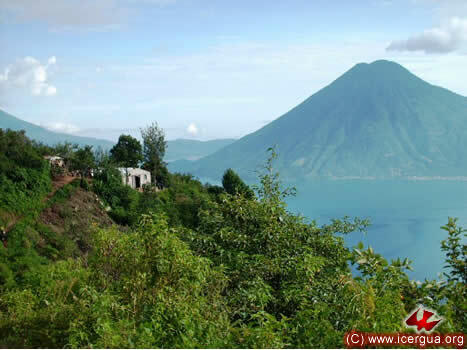 In the background, the majestic Lake Atitlán and the Volcano of San Pedro. 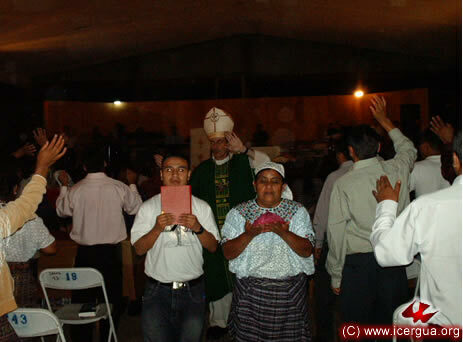 right: The faithful participating intensely during the prayer in Chuitzanchaj, making confession of their sins. AUGUST 7. 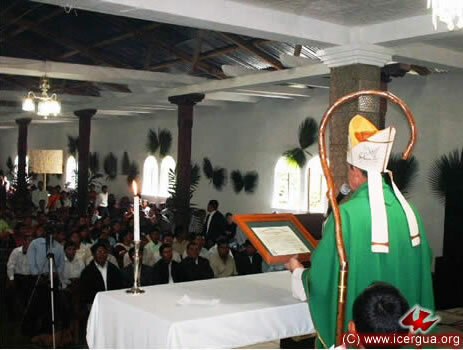 ASSEMBLY IN HUEHUETENANGO. 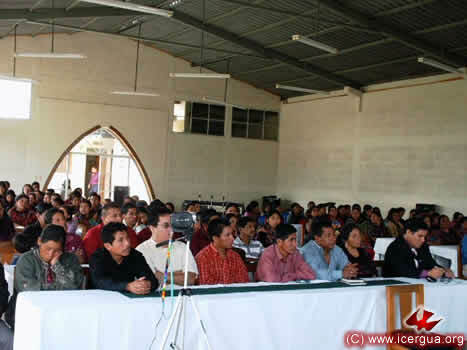 During the morning of August 8, the Trimester Assembly took place, about 100 of the faithful from the area south of Huehuetenango and Santa María Chiquimula participating. Until last year, the delegates of all the regions met here. Now, with the creation of the Deaneries, the bishop visits the different zones every three months, and only the members of that particular zone gather for the meeting. 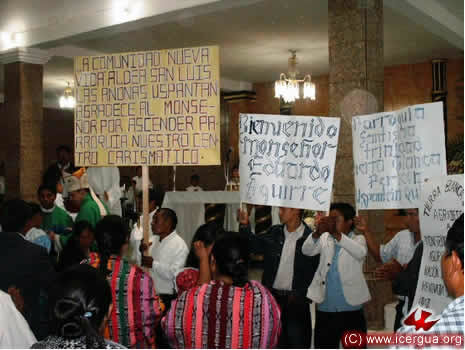 Starting in November, the representatives of Nentón, Jacaltenango and Concepción Huista will meet in their own area, for it has been agreed to create a new deanery there, the West Huehuetenango Deanery. above: The bishop instructing the Assembly. right: some of the participants attending the Assembly. AUGUST 8. 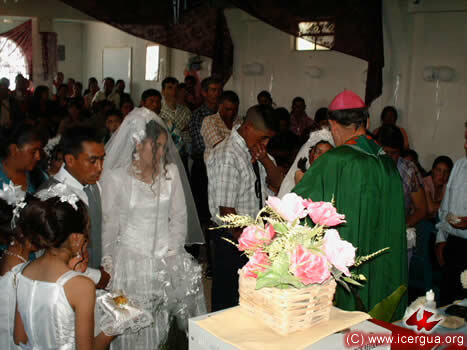 MARRIAGES IN AGUA DULCE, SAN PEDRO NECTA. On the afternoon of August 8, our bishop visited for the first time the new Community of Agua Dulce, located in the municipality of San Pedro Necta, Huehuetenango. With great effort, the faithful have succeeded in building an oratorio. On this occasion, two marriages were celebrated and the Most Holy Sacrament was left so that it could be distributed to the People of God. AUGUST 8. CELEBRATION IN CHINACÁ, HUEHUETENANGO. During the evening Mons. 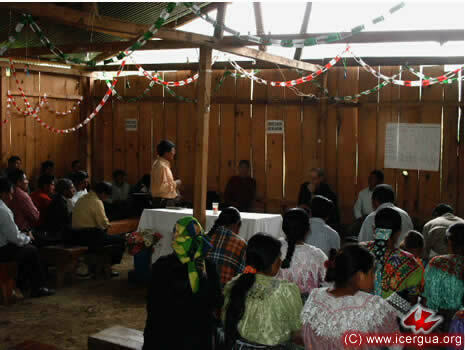 Eduardo presided at the Eucharist in the Community of Chinacá, Huehuetenango. 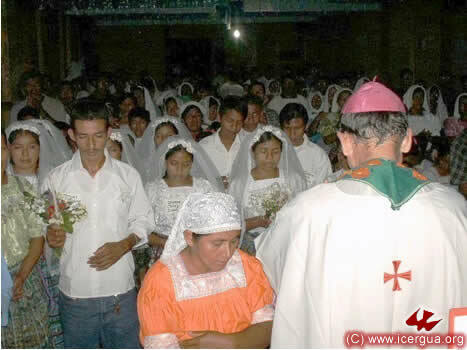 Marriage was celebrated between two members who, after many years of living together and experiencing the healing that the Lord gives, decided to open themselves to having their union elevated by the action of the Holy Spirit and the ministry of the Church through the Sacrament of Marriage. AUGUST 9. CELEBRATION IN BRASILIA, HUEHUETENANGO. 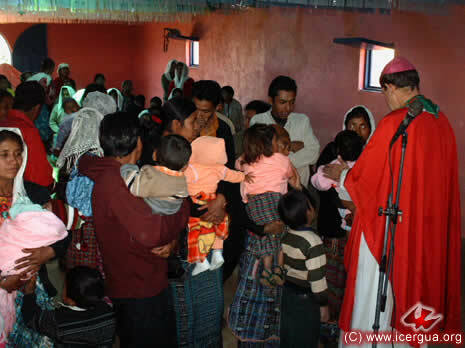 On the morning of Sunday, August 9, the bishop celebrated Eucharist in the Community of Brasilia, Huehuetenango. On this occasion two baptisms and two marriages were celebrated. right: One of the couples who contracted marriage as they were exchanging their vows. AUGUST 13. 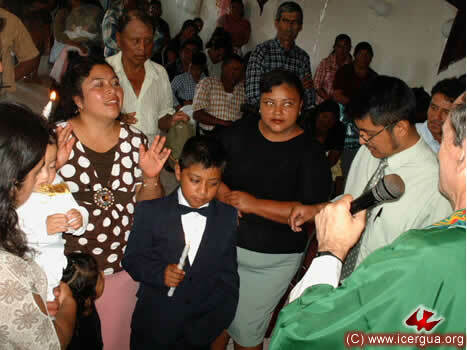 CONFIRMATIONS IN MATAQUESCUINTLA, JALAPA. 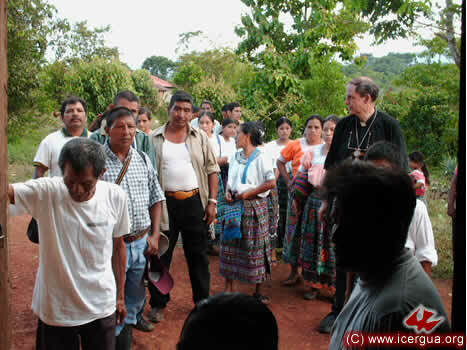 During the afternoon of August 13, our bishop visited the Community of Mataquescuintla in the Department of Jalapa. The community here came into being as a charitable agency and was located in the Church of the Calvary. Nevertheless, with the passing of time, the community has taken its own shape. A Pastoral Council has been formed, with whom the bishop had the opportunity to meet. They accepted the commitment to work for the complete formation of a parish with all the ministries and activities involved in that. At the end of the meeting, Eucharist was celebrated in which there were several baptisms, confirmations and first communions. The pastoral work here, almost from the beginning, has been in charge of Nelson Quiña, a seminarian. A positive path has been successfully followed, and it is hoped that now with its own identity, the establishment of the Pastoral Council, and the support of ICERGUA, it will succeed in consolidating and carrying out our mission in the east of the country. AUGUST 14. DEANERY OF LAS VERAPACES AND PETÉN. On Friday, August 14, in the presence of about 50 delegates coming from all of the Department of Alta Verapaz, from the area of Ixcán (Quiché) and from Petén, the trimester meeting of the Deanery of Las Verapaces and Petén took place. For the first time the meeting was held where, with the help of God, there will soon be the chapel of the Central Mission, located in Tomtem, at kilometer 203 on the highway from Guatemala City to Cobán. At the meeting a new deanery was created to tend to the needs of the northern part of Alta Verapaz and the Department of Petén, which will have its meetings, beginning in November, in some of the communities of the municipality of Sayajché (Petén). 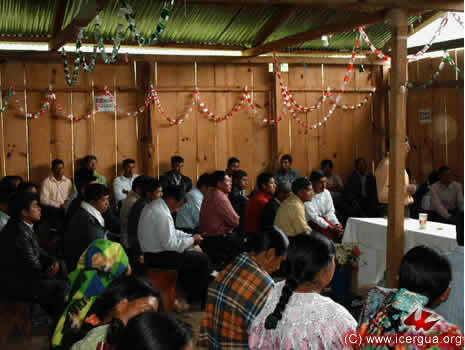 In addition, in view of the rapid growth in Ixcán, the possibility was outlined of having a deanery and mission center in the near future in this zone to meet the pastoral needs there. AUGUST 14. 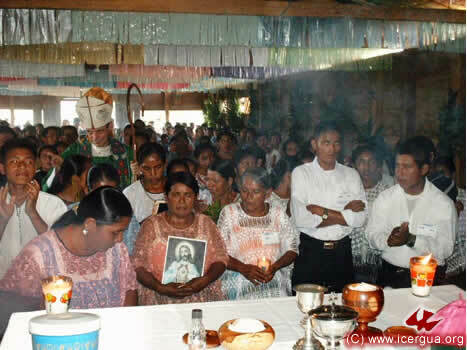 EUCHARIST WITH THE COMMUNITY OF COBÁN. 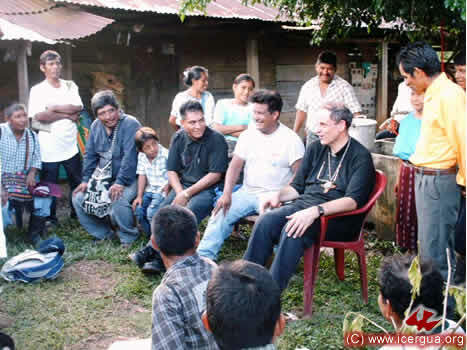 During the evening of August 14 the bishop visited the small community of shopkeepers that meets in the city of Cobán. Most of its members come from various communities in northern Quiché. The community is growing slowly, and the enthusiasm and commitment of its members leads one to think that it will soon be consolidated. AUGUST 15. VISIT TO THE COMMUNITIES OF IXCÁN, QUICHÉ. On Saturday, August 15, Mons. 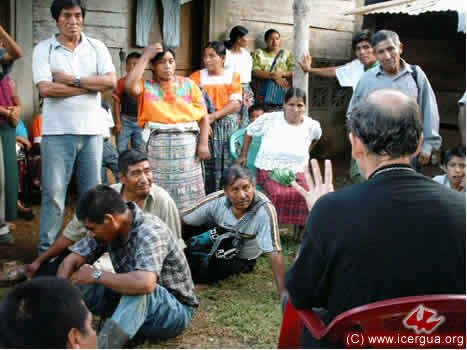 Eduardo visited the communities of Ixcán in the northern part of the Department of Quiché. The trip was long; however, the fruits were abundant. The first visit was at the Community of Santa María de Candelaria. The reason for the visit was to install a Minister of Communion and formally to install the presence of the most Holy Sacrament in the church. The Eucharist was joined by one of the ministries of the Community of Pueblo Nuevo, another of the settlements in the region. This community is small, but has become the focus of evangelism in the area. above: Leaders of Candelaria, of Pueblo Nuevo and of Santiago receiving the bishop. The second visit was to the community of San Juan Ixcán in the southern part of the area, bordering on the Reina de Uspantán zone. It is a community that began only a short time ago, but already has several families and is growing rapidly. 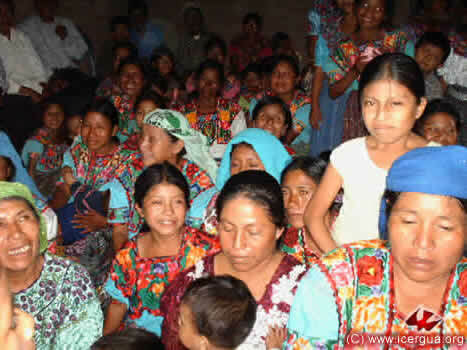 This community is predominantly K’eqchi’. 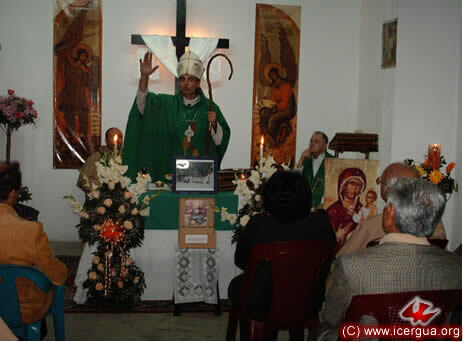 left: The posters that were prepared in Santiago Ixcán to welcome the bishop. 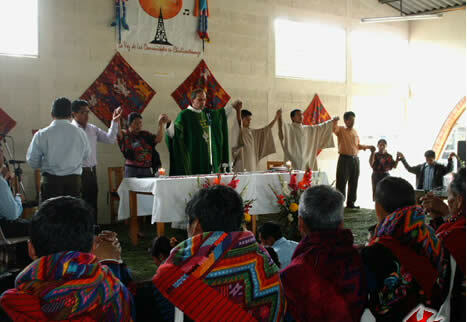 On arriving at Santiago, the third stop in the visit to Ixcán, there was a meeting with the pastoral council of the communities (Santiago, San Juan, Candelaria, Xalbal and San Antonio) and representatives of the Council of the Charismatic Renewal of Pueblo Nuevo and seven neighboring communities. 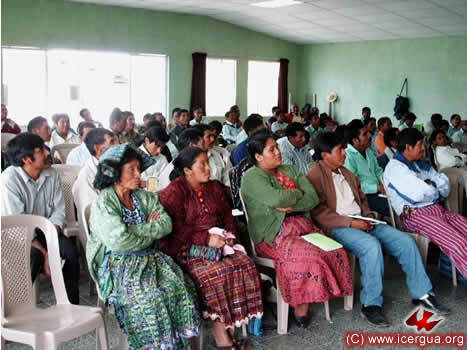 The reason for the visit with this council was to continue the dialogue that began with the Pastoral Council of Santiago to make an alliance with and join ICERGUA. As result of the dialogue the representatives of the communities that were present decided to make the alliance. Among these are Pueblo Nuevo, Cuarto Pueblo and San Lorenzo. The pictures above and left: Different moments of the meeting with the Pastor Council of Santiago and with members of the Council of Pueblo Nuevo. 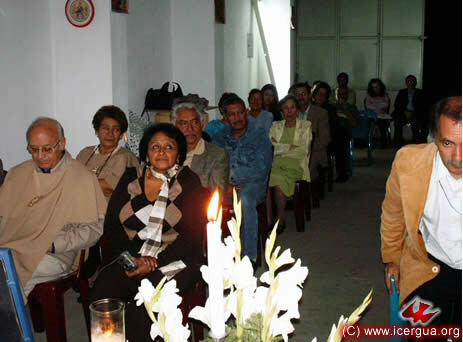 The activity ended with the Eucharist celebrated in the house of prayer in the Community of Santiago Ixcán. About 700 faithful participated in the celebration. Baptisms, Confirmations and First Communions were celebrated. Furthermore, it was authorized, as of this date, to use provisional registers to record the various sacraments that are celebrated. On completing all the steps required to create the Parish of Santiago, the provisional records will be transferred to the appropriate permanent books. above: The candidates for Confirmation in deep prayer. 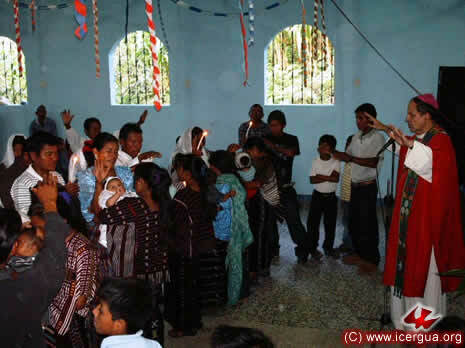 right: During the celebration of Baptisms. right: After the celebration of Confirmation, parents and sponsors of those confirmed pray over those who have received the outpouring of the Holy spirit that they may persevere on the road of faith and in witness to the Gospel. AUGUST 16. VISIT TO THE COMMUNITY OF CHISEC, ALTA VERAPAZ. 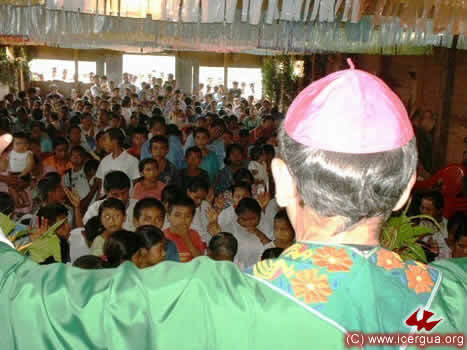 After several hours of traveling from Cantabal, Playa Grande, where the bishop spent the night, at 9:00 am on August 16, he presided over Eucharist in the Community of Central Chisec, Alta Verapaz. Up to now, this community has been meeting in private homes. In preparation for the bishop’s visit, the faithful in the community built the foundation of what will be its church. it is located next to the radio station that this community has in Chisec. Beginning with this visit, Central Chisec will have the permanent presence of the Most Holy Sacrament. AUGUST 16. VISIT TO THE COMMUNITY OF SESUCHAJ, ALTA VERAPAZ. 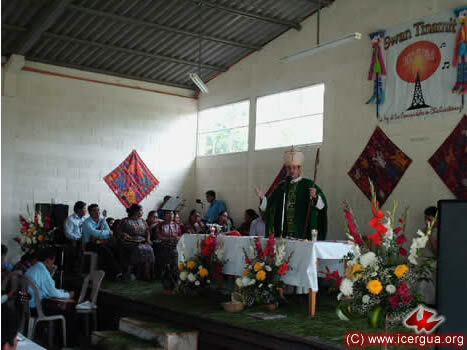 At 11:30 on August 16 the bishop presided at a solemn Eucharist in the Community of Sesuchaj, Chisec. 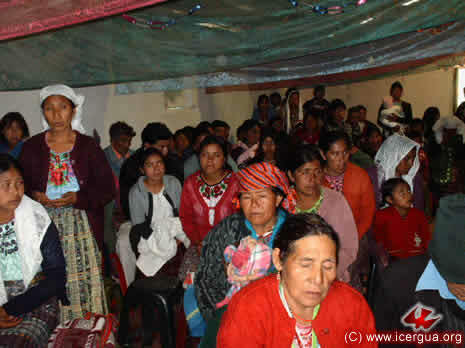 Several dozens of the faithful from Sesuchaj and Sesaquiquip were confirmed. About a thousand participated in the celebration. Most belong to the community of Sesuchaj, although some also represented neighboring communities. above: The entrance procession in the midst of the multitude of parishioners. left: The bishop is inviting the participants to prepare themselves for the confession of sins before beginning the Eucharistic celebration. right: Those confirmed praying intensely, invoking the outpouring of the Holy Spirit. On the occasion of the bishop’s visit, four new ministers of communion were installed: two for the communities Sesaquiquip and two for a new community that has made an alliance. left: The four newly installed ministers present the consecrated bread. AUGUST 20. 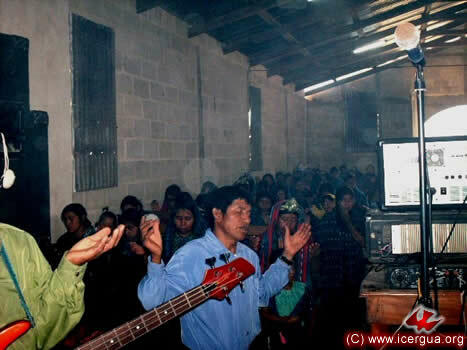 BLESSING THE COMMUNITY RADIO STATION SWAN TINAMIT IN CHICHICASTENANGO. 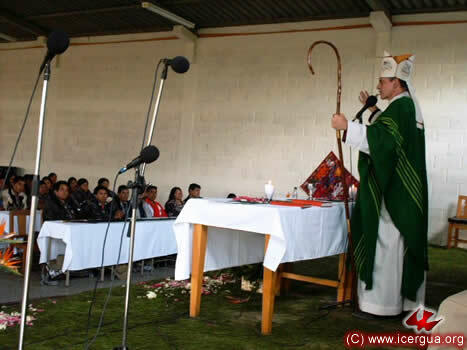 On Thursday, August 20, our bishop was invited to preside at the Eucharist on the occasion of the blessing of the new equipment for the community radio station, “Swan Tinamit,” sponsored by the Chichicastenango Association for Community Development, Quiché. It was a solemn ceremony in which the authorities of the Indigenous Municipality as well as the Municipal Corporation were present. 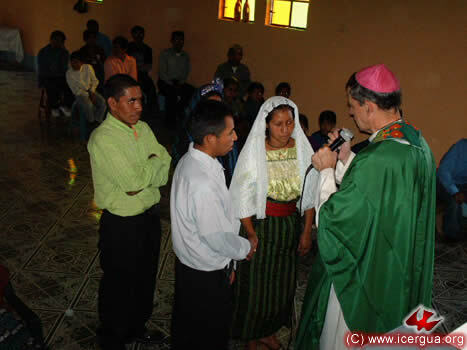 above: Our bishop greeting the authorities of the Chichicastenango Indigenous Municipality. left: The homily. In the back can be seen the members of the Choir of San Juan, from our Cathedral of San Juan Comalapa. The choir was invited to accompany the Eucharistic celebration to enhance the ceremony. right: The biblical lessons were read in K’iche’ and in Spanish. In the photo, the homily by our bishop is being translated into K’iche’ by the President of ASDECO. left: The singing of the Our Father was especially moving. The participants, joining hands and recognizing themselves as children of God and brothers and sisters of all human beings, are praying together, united in one body. AUGUST 22-23. MISSION TO LOS ANGELES, CALIFORNIA. The visit that our bishop made to the communities of Los Angeles, California, was especially significant. About 500 faithful members of the three communities that have made an alliance with ICERGUA and three others that are contemplating one obser-ved a solemn vigil. above: The auditorium of the retreats house. One of the most beautiful things to see is the way many of the ministries that had been divided are at present, although maintaining their autonomy, becoming organized so that they can make an alliance with ICERGUA and form the Los Angeles Mission of our church. The participants are especially keen that in the near future it will be possible to decree the creation of the parish. 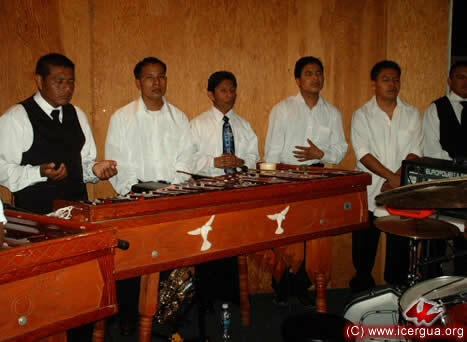 above: Members of one of the several music ministries in the communities. 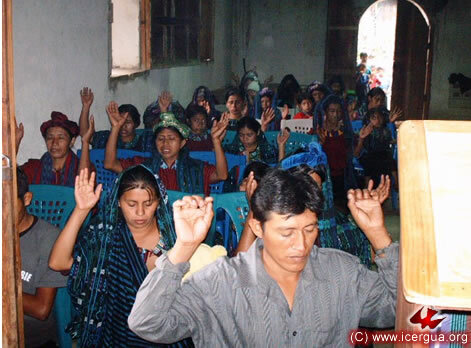 This ministry is made up of brothers coming from Santa Cruz Barillas, Todos Santos and Totonicapán. One of the ministries’ concerns is to preserve their cultural and religious identity. left: The faithful coming forward to receive communion. The Mass ended at 10:15 pm. After a short rest, the vigil continued with prayer, preaching and praise until 5:00 am. right: our bishop in the recession, praising the Lord and greeting the faithful. In front is the reader, a brother from Totonicapán, and the minister of the communion, a sister from Nucá, Santa Cruz Barillas, Huehuetenango. AUGUST 23. 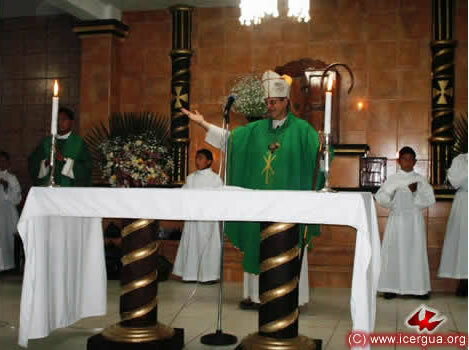 EUCHARIST IN THE SAN JOSÉ ORATORY: THE ANNIVERSARY OF FATHER HERBERTH. In the evening of Wednesday, August 23, our bishop presided at the Eucharist in the San José Oratory in Guatemala City. 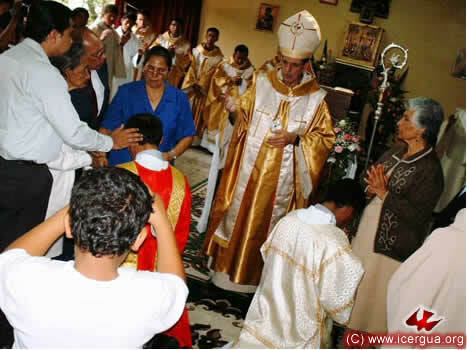 The faithful had prepared the celebration to give thanks to the Lord for the nine years during which their priest, Father Herberth Urrutia, has been ordained. left: Fr. Herbert, Mons. Eduardo and Fr. Andrés, a Trinitarian who was Fr. Herberth’s seminary teacher. right: The bishop’s homily. 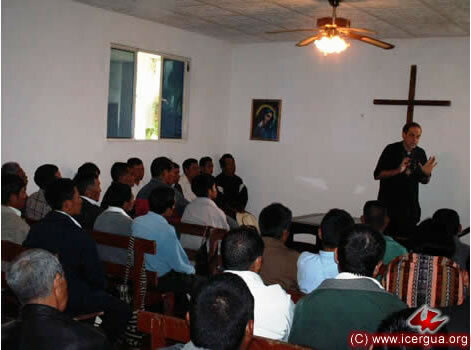 He spoke about the mission of the ordained ministry in ICERGUA. The oratory was decorated with beautiful icons. In the back are the icons of Saints Archangels Michael and Gabriel. In front is an icon of the Theotokos. On the altar is a photo of Mons. Próspera Penados of blessed memory, who was the Roman Catholic Archbishop of Guatemala and who conferred Holy Orders on Fr. Herberth. left: After the homily Fr. Herberth addressed the community and shared some of his experiences during his years as a priest. He promised to work apostolically with a renewed commitment. right: Those assisting the Eucharist. Besides the many members of the San José Oratory, there were present two representatives of the new Community of Los Olivos, in zone 18 of the capital, which some time ago Fr. Herbert began to serve and which is growing powerfully. AUGUST 28. VISIT TO THE COMMUNITIES OF JAIBALITO AND TZUNUNÁ ON LAKE ATITLÁN. 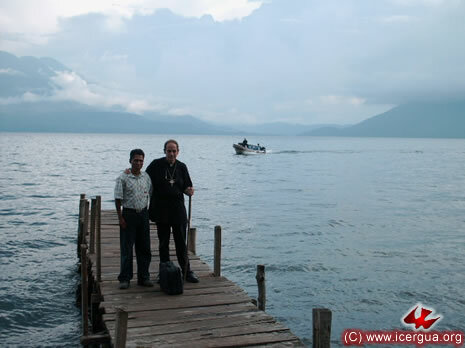 On the afternoon of August 28, our bishop made his regular visit to the Communities of Tzununá and Jaibalito on the banks of Lake Atitlán in the municipality of Santa Cruz La Laguna, Sololá. The growth in faith and in number in these communities is noteworthy. 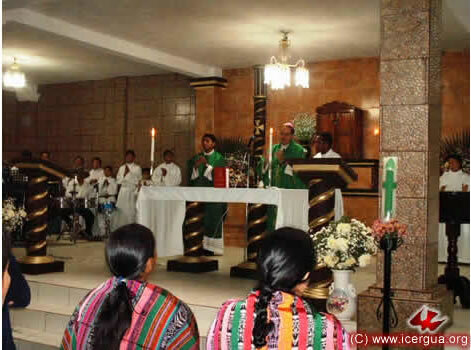 above: The liturgy of reconciliation in the house of prayer in Tzununá. right: After the Eucharist , Brother Antonio, one of the leaders of the Community of Jaibalito, accompanied the bishop to the boat for Panajachel for his trip to Huehuetenango. AUGUST 29. 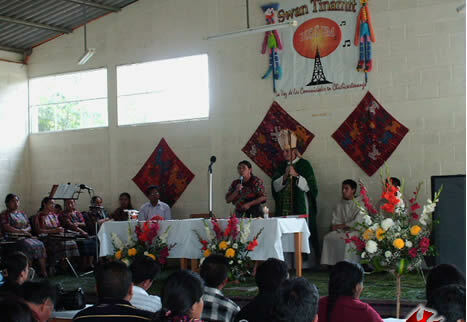 CELEBRATION WITH COMMUNITIES OF CONCEPCIÓN TUTUAPA, SAN MARCOS. 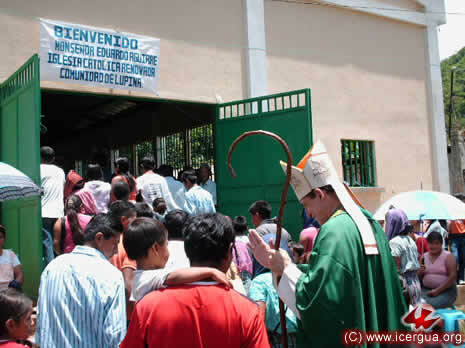 On Saturday, the 29th, the bishop visited the three communities that are in Concepción Tutuapa, San Marcos. In both communities growth has been rapid and steady. 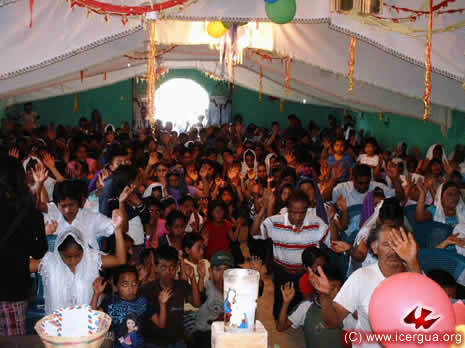 In the first, the culminating moment was the reception of 30 faithful who come from the Pentecostal church and from a spiritualist group who after a long period of prayer and fasting felt the call of the Lord to become part of our Renewed Catholic Church through showing fully the life and church organization with which Christ founded his church. above: The faithful who were welcomed into the church. They meet under the leadership of Brother Armando in a section of the village of Tictúcabe. 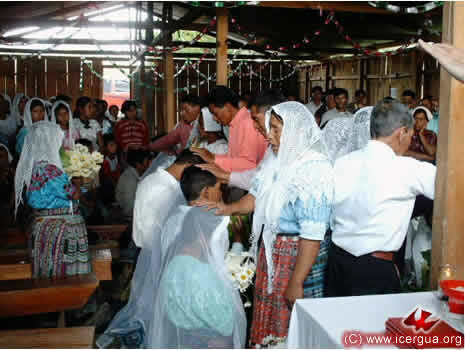 right: The observance of baptisms in the recently constructed house of prayer in the village of Tuctúcabe. On the occasion of the bishop’s visit the house of prayer was blessed. Brother César and a council of the faithful lead this community. AUGUST 29. 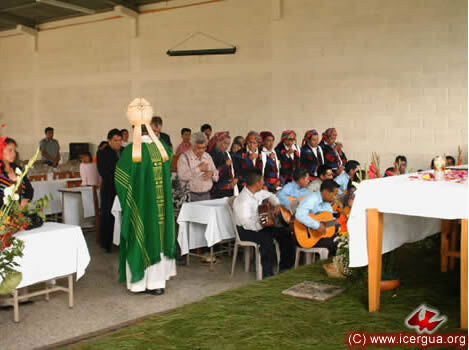 EUCHARIST IN LA VEGA, COLOTENANGO, HUEHUETENANGO. On Saturday, August 29, during the afternoon, Mons. Eduardo visited the community of La Vega in the municipality of Colotenango. 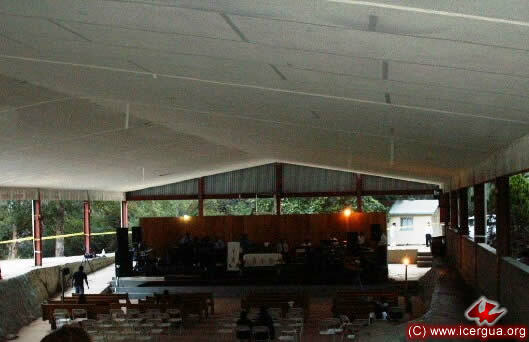 The members have practically finished the construction of a beautiful 2100-square-foot church. All that remains to be done are the decorations on the façade. On the bishop’s visit many baptisms were observed and an elderly woman made her First Communion and Confirmation. above: The faithful coming forward to receive the declaration of absolution of sins after making confession. right: At the end of the baptisms parents and sponsors pray for the children who have been baptized. AUGUST 30. 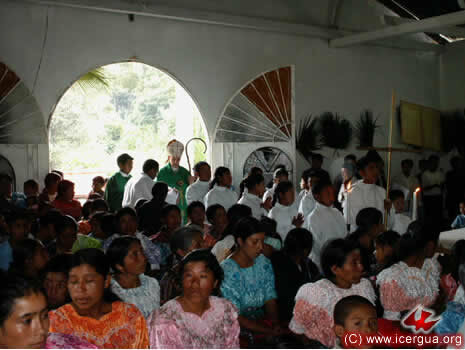 CONFIRMATIONS IN PETATÁN, CONCEPCIÓN HUISTA, HUEHUETENANGO. On the morning of Sunday, August 30, Mons. 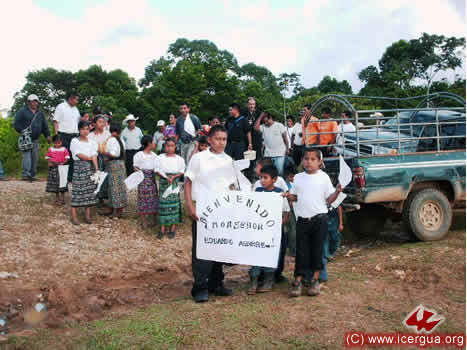 Eduardo visited the Community of Petatán, Concepción Huista, Huehuetenango. It was a most beautiful festival. About a thousand members participated, although only a small fraction could get into the church. The rest had to be content to participate from outside. Twenty faithful were confirmed, four marriages were celebrated, and there were also baptisms. 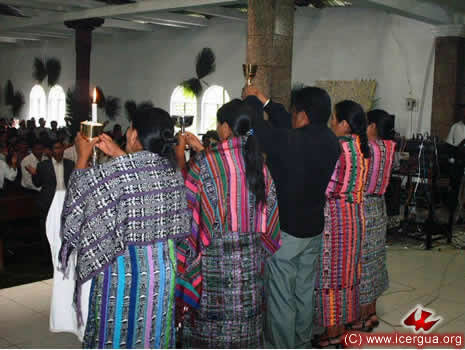 This community will be the temporary seat of the Central Mission, from which the Communities of Jacaltenango and Concepción Hista will be served. AUGUST 30. VISIT TO LUPINA, JACALTENANGO, HUEHUETENANGO. 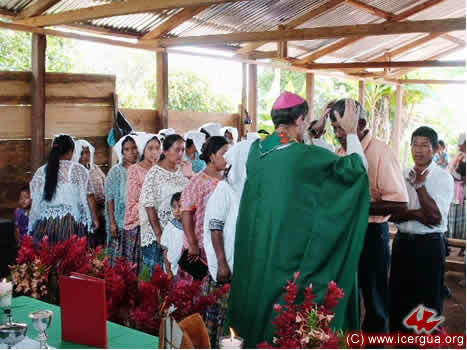 Toward midday, more than a thousand members of the Communities of Lupiná, Chejbal and Pepilpán, in the municipality of Jacaltenango, welcomed the bishop, who presided at a celebration of the Eucharist. In this area our church is experiencing rapid growth. 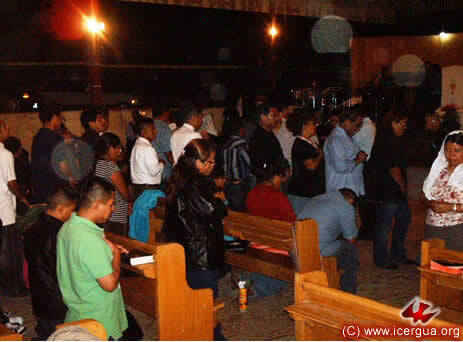 A few days ago, 120 young people in the community of Inchegüex decided to join the Church. Now they are in a period of prayer and fasting, asking that the Lord make the same call to the adults. above: The bishop entering for the celebration.